Bamboo Avenue is located on the main South Coast Highway, between Middle Quarters and Lacovia, in the parish of St Elizabeth. 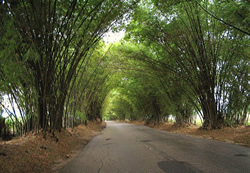 The avenue was planted out with Bambusa Vulgaris a specie of Bamboo which was the largest variety introduced in Jamaica. The avenue is approximately two and a half (2 1/2) miles long with the tall bamboo forming a canopy over it.